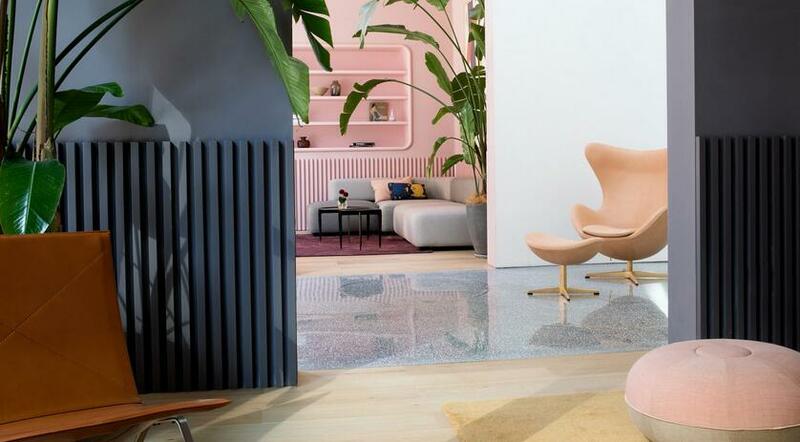 The 1,000-square-metre store is the Danish furniture brand's biggest ever and its first in China. Dario Reicherl, the brand's Asia CEO, said the store was a statement of its ambitions for the Chinese market. "[In China] you always need to find a way to be new, never done before – you need to create an experience," Reicherl told Dezeen. "Through a series of steps, I believe we can be the biggest Danish brand in China in a couple of years." Above: The interiors of Fritz Hansen's new store in Xi'an. Top image: Warm hues like pink and slate blue appear throughout the space. 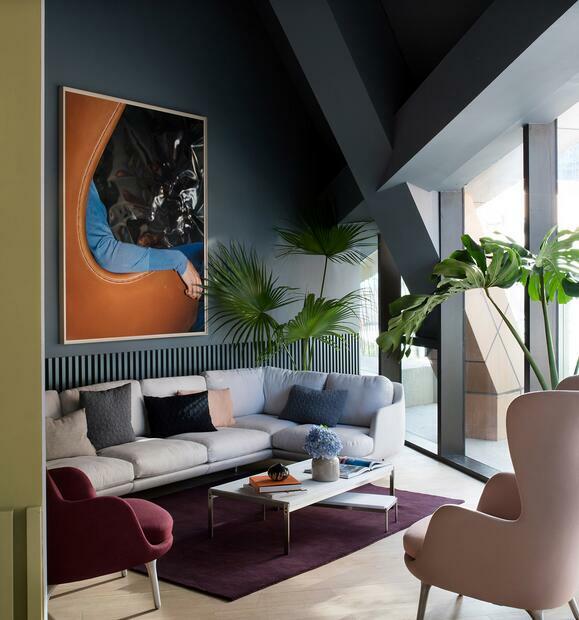 Fritz Hansen Gallery Xi'an features "temple-like" interiors with high ceilings, warm-hued walls and vaulted walkways created by the Spanish designer, who has previously designed products including a range of office furniture and a wingback armchair for the brand. "Height and cosiness are not very good friends, but it was an opportunity to make something spectacular," Hayon told Dezeen. "When I entered [the space] for the first time, it was like a temple, it's so high, you've got this possibility to express yourself in an interesting way. I used the industrial gut of it to contrast to the softness and the beauty and the organic shapes that we created inside." Customers enter the store through a tall set of doors with "lung-shaped" windows that look through to a white-painted central lobby. 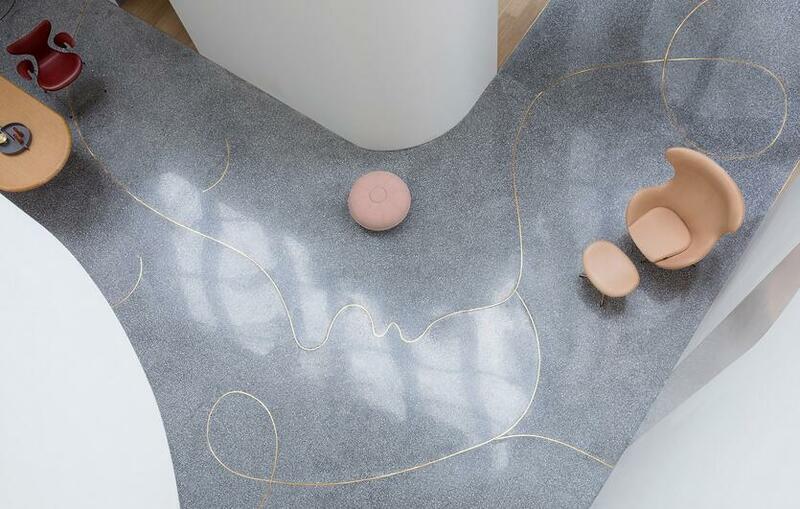 The grey terrazzo floor here is inlaid with a snaking line of brass that, when viewed from above, appears as an abstract face. 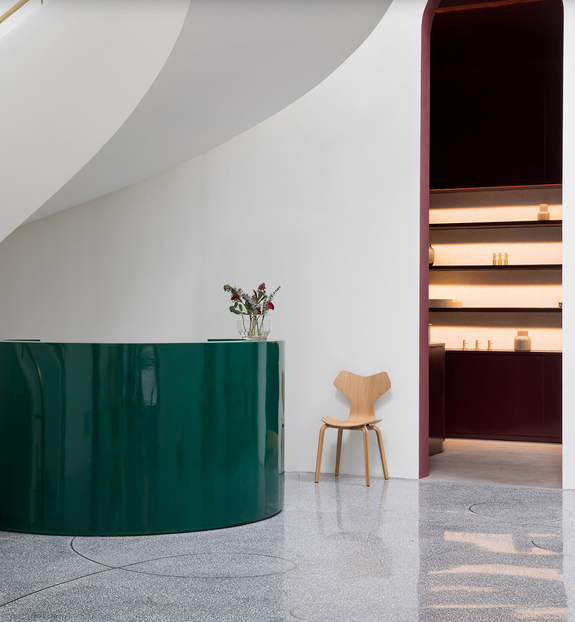 This area, which is anchored by a sweeping staircase and glossy green reception desk, leads to 14 smaller rooms that display the Fritz Hansen collection in more intimate settings. Keen to avoid the typical layout of retail stores where products are stacked or arranged in monotonous rows, Hayon instead took a "scenographic" approach to arranging the rooms. Sofas, armchairs, rugs, and coffee tables have been placed in living room-style setups, with leafy potted plants dotted throughout. 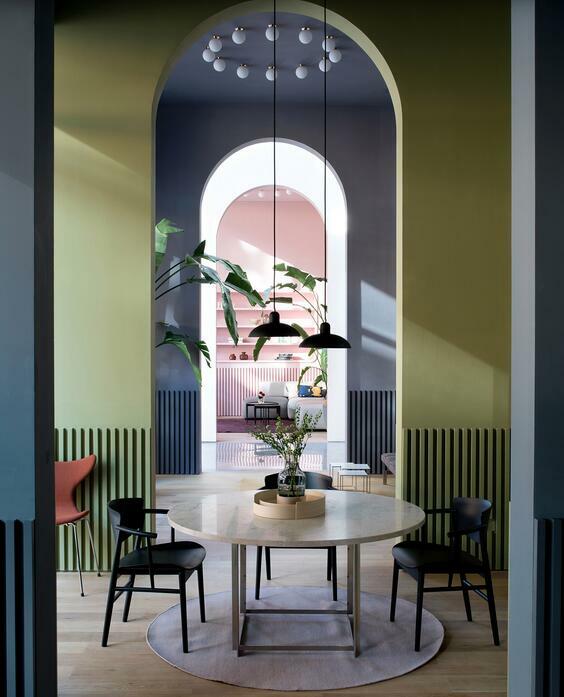 Surrounding walls that feature grooved panelling have been painted warm colours like sage green, rose pink, plum purple, and slate blue. 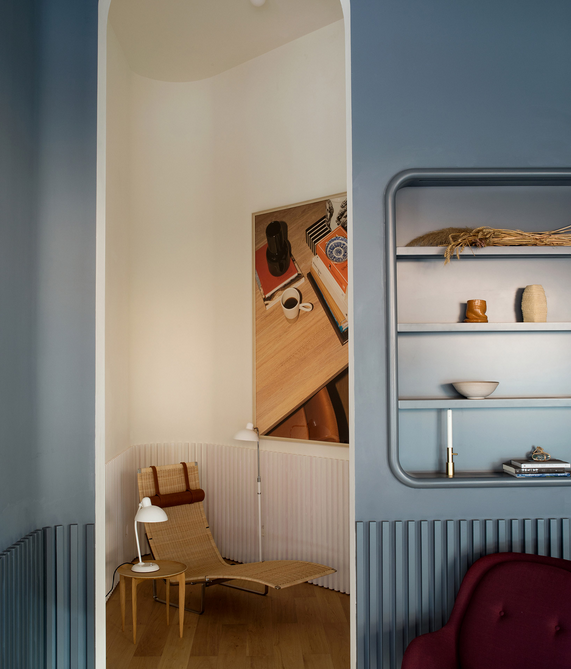 "Like in a labyrinth, you start to discover the little areas and each one has the furniture of Fritz Hansen, from the historical ones to the new ones I have designed, and pieces from other designers," explained Hayon. "The lighting and everything has been composed together with some art, carpeting, plants and small objects. So in this way we can inspire the client." Upstairs on the second floor, surfaces are much more neutral tones like sand-beige and dark grey, complementing the light timber floorboards that run throughout. Rounded nooks in the walls display smaller ornaments like candle holders and vases. Founded in Denmark in 1872, Fritz Hansen produces classic items by pioneering twentieth-century Danish designers including Arne Jacobsen and Poul Kjærholm, as well as contemporary figures including Cecilie Manz, Benjamin Hubert and Nendo. 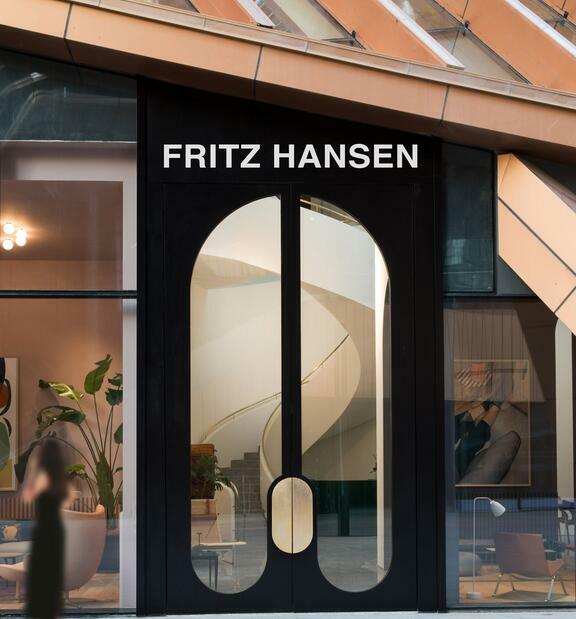 According to Lars Hardboe Galsgaard, executive vice president of sales and marketing at Fritz Hansen, the brand's move to China comes in response to a growing demand in the country for more understated luxury products for the home. "[China] is the second biggest luxury market in the world, soon overtaking the US," Galsgaard told Dezeen. "It will definitely be the biggest market and economy in the world in terms of private consumption and commercial consumption within a few years. So if you look at that marketplace, we needed to move here. We need to be part of that and we need to be part of defining design, furniture and lifestyle in China." Fritz Hansen Gallery Xi'an occupies a towering building in the city, which is one of the oldest in China and was the starting point of the Silk Road network of trade routes. The capital of Shaanxi province, it has a population of just over 12 million. In 2011 it hosted the Xi’an International Horticultural Expo.